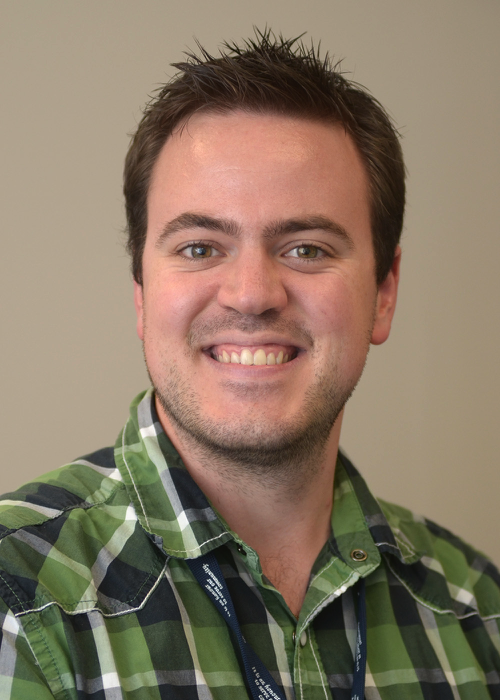 Bio: Bill Simpson is a 4th year PhD candidate in the laboratory of Drs. Meir Steiner and Benicio Frey. Their research focuses on the impact of reproductive cycles on mood disorders in women, and is aimed at promoting women’s mental health across the lifespan. Bill’s work centers on examining the impact of biological rhythm (e.g., sleep) disruption on the risk of postpartum depression. He is a founding member of the Students of MiNDS Association (SOMA) and is the Director of scientific development at MEMOTEXT Corporation, a companythat provides e-health solutions for patient medication adherence. In his spare time, Bill enjoys playing softball and taking long walks through farmers’ markets. He also has a love of craft beers and cooking. What advice do you have for students who are new tothe program? Never lose sight of your personal goals for grad school. Others may try to pull you in a different direction, but at the end of the day, grad school is your experience. What you put into it is directly related to what you get out of it. Looking back, how was your first year in the MiNDS program? As cheesy as it sounds, it just felt right.I had finally found what I was supposed to be doing. I remember when I was atmy undergraduate convocation: I felt pretty apathetic, finishing undergrad kindof felt like my 8th grade graduation. It didn’t feel like it wasover and I definitely didn’t feel fulfilled. But my first year of grad schoolfelt like I was on my path to fulfilling my academic aspirations. I was finallyin an environment where people shared my passions and interests. What advice would you give to your first year self ifyou could? Make sure you keep your priorities #1. Don’t overextend yourself by trying to helpeverybody, or collaborate on every single project that comes your way. Spreadingyourself too thin can hurt you in the long run. Don’t get me wrong, beinghelpful and collaborative is important, but be aware of what you can handle. Makesure your research goals are at the top of your list. What was your favourite conference ever attended? Why? Well, one I attend every year is theSociety for Biological Psychiatry (SOBP) conference. In between undergrad and graduate school, Iworked as a research assistant, so I love the blending of clinical outcomeswith basic science. That’s exactly what SOBP covers and for my field, I don’tthink there is a better conference. The researchers who attend are top notch,the networking opportunities are great, the welcome reception is awesome, andall poster sessions are very well attended (and include food and drink!). Well, I have a few, so let’s go with thetop 3. Playing softballin the summer in the GSA softball league (let me know if you want to join!). Itis ‘D’ league. Lunches with thecolloquium speakers! They’re great. I remember going to a talk with Pierre Blierfrom the University of Ottawa and hearing his incredible story of how adifficult situation with his father’s health inspired his entire researchprogram. It had a big impact on me as a student. Lastly, MiNDSperiodically hosts summer symposia that feature 2hr open-ended talks with a receptionafterwards. Some of my most interesting and memorable conversations with other researchers in the field came out of those experiences. What are your plans for after you complete your degree? I’d say right now I am 80% private sectorand 20% research, that’s how I hope to divide my time. Ideally, it would be 4days working for MEMOTEXT and 1 day still working as a collaborator in-researchso that I can get the best of both worlds.